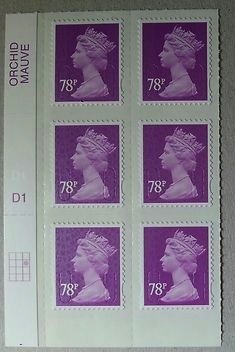 De La Rue 78p sheet stamps now available - to some. The 78p stamp printed by De La Rue has now appeared in counter sheets. The stamp was issued on 26 March, available at Post Office branches printed by Walsall Security Printers, and in presentation packs and on Royal Mail fdcs printed by De La Rue. Now, thanks to Ian R, we can report that a cylinder block from a DLR counter sheet has appeared on eBay, either from a Post Office counter, or from Royal Mail Edinburgh. No doubt these will be available through the Bureau as I have received the De La Rue MA13 of the £2 from them.